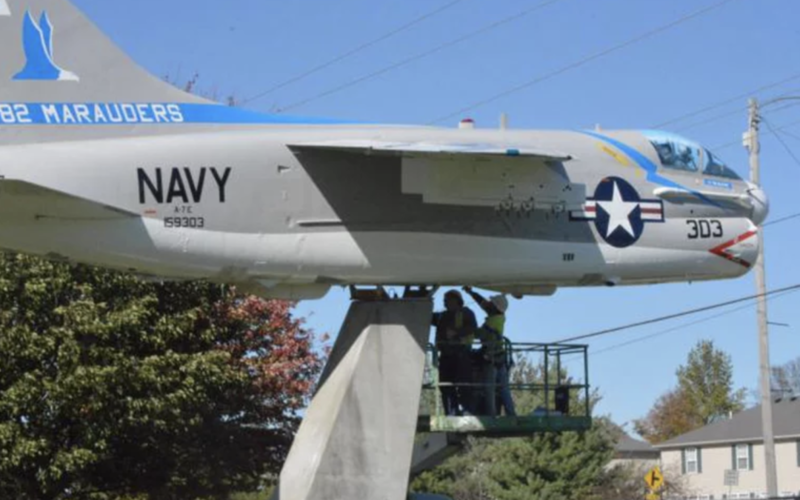 EDWARDSVILLE – The beloved U.S. Navy A7E Cosair plane at Robert C. Stille Edwardsville Township Community Park is back on its display pylon. Keller Construction placed the plane back on its display pylon in the morning hours Thursday and by noon, many were showing up to see the new display. Keller donated its time and equipment on both the take down and uplifting back to the pylon. Cars that drove by also noticed the famed Cosair is back and completely restored. Edwardsville Township Supervisor Frank Miles was ecstatic to see the plane revitalized and back on its permanent perch. Jared Ashley, the CEO and founder of the Flight Deck Veterans organization, was on hand with the volunteers. Ashley was born in Hobbs, N.M., but was raised in Newnan, Ga., and joined the U.S. Navy Jan. 7, 1997. Stationed in Yokosuka, Japan, he was assigned to the V-1 Division on board the USS Independence from 1997-1998. Jared was honored to be one of the last crew members to walk across the brow after decommissioning the carrier in Bremerton, Wash., in the fall of 1998. In 1999, Jared joined V-1 Division on the USS Kitty Hawk, which replaced the Independence as the new forward deployed aircraft carrier stationed at Yokosuka Naval Base, Yokosuka Japan. While serving on board the USS Independence and USS Kitty Hawk, Jared did two tours in the Persian Gulf in support of Operation Southern Watch and Desert Fox. Jared got out of the Navy on Jan 7, 2001. and moved to Nashville, Tenn., to work in the music industry as a singer/songwriter. Jared has a wife and young daughter and spends his spare time dedicating himself to the Flight Deck Veterans Group. “We’re trying restore this A-7 to like new condition so it can be enjoyed in it’s glory,” he said last week. “A part of the Flight Deck Veterans Group mission statement is ‘veterans serving veterans’ and we consider these planes a veteran. We’ve restored a few of them across the country. All of our have served on the flight deck of an aircraft carrier or within a flight line. ”It’s all volunteers,” he said. “These are veterans who worked with these plans, and they all have jobs or they’re all retired so they come out when they can come out just to help. These guys aren’t getting paid. We do it because we want to save this plane. We want to see this plane last forever. When we’re too old to care there will be other kids here taking care of this plane. What we’re trying to do today is preserve this plane that so that it will be around longer than we will. Ashley loved his time in Edwardsville. “It’s a cool town,” he said. “People are nice. The town, they grew up around this plane and they’re sentimental to it, as veterans we’re even more so. We don’t live here so it’s pretty impressive to see the dedication to this plane from civilians who didn’t serve. Now they’re true patriots to us because they’re severing this plane and making sure it gets it’s due diligence.